A chef’s dream job may be the death of her. Chicago native Carrie Ann Cole has come to Kensington Palace to work as the family chef for the Duke and Duchess of Cambridge. The security is tight and the palace rules daunting, but she quickly settles into her little suite and starts to meet the natives. Handsome Ian Gordon, head of security, greets her warmly, but Mrs. Worth, the household manager, is made of sterner stuff. Carrie Ann’s kitchen staff includes butcher Frank Deems, prep man Michael Haregrove, and Jasper Fedman, who supplies the household with greens and herbs from the attached greenhouse where Carrie Ann finds Deems’ dead body. His murder puts the palace staff in an uproar, for either there was a major security breach or the killer is a staff member. Carrie Ann’s work is restricted to a small area in the large kitchen run by resentful Chef Butterbottom, who thinks he should be providing food for the Cambridge family. When Haregrove is arrested for the murder, Carrie Ann feels sure he’s innocent, but all she can do is take food to his wife, who’s battling cancer, and their two young boys. Not until the greenhouse is torn down does she finally meet Fedman, a strikingly handsome man who invites her out to dinner. Unfortunately, their goodnight kiss is witnessed by her boyfriend, John, a rising culinary star who flew in from Chicago to propose. It was hard enough for Carrie Ann to put their six-year relationship on a long-distance basis when he refused to move to London; now John’s moving to California, where he wants her to become his sous chef. Carrie Ann distracts herself by making inquiries about the staff. She learns that Deems had a gambling addiction that might just provide a motive for murder, though proving it won’t be easy. 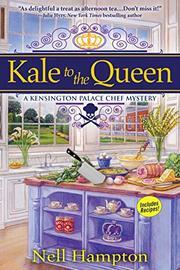 A charming debut foodie cozy with a gutsy heroine, a neat little mystery, and the requisite appended recipes.